This review is about item#10054825. As is also the impression of other people, consumption is fast, but I am very satisfied that I could rust off efficiently accordingly. Because it is inexpensive, I was a little worried about purchasing, but I'm very satisfied with the performance beyond imagination and imagination. Both abrasive power and durability are not defeated by expensive items. I immediately tried repeating. Although the result was better than expected, I felt it was a bit too hard as it was used to remove paint on the aluminum wheel. It was easier to use than I thought it was good. I would like to purchase again. I bought it for sheet metal painting of construction machine, but it is good that the ground can not be scraped. Until now I used disc type things, but the place where the different kind of paint was painted was soon filled with eyes, but this product has never been like that I can use it. I think that it will be a little cheaper in terms of price. I would like you to make 10 entrances instead of 5 more. Because the price is cheap and easy to use, I purchase repeat. Those with high prices are also certainly good, but you can use it even if the price is cheap. When products are brand new, they will give you a pleasant polishing ability, but if you decrease it a little, the polishing ability drops sharply. I want you to improve the remarkable decrease in polishing ability, even if I endured it is decreasing. 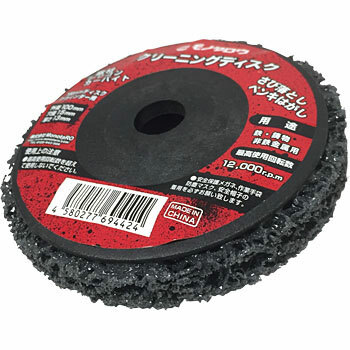 We bought this product to peel off 16 sheets of steel sheet about 175 cm × 48 cm. The steel plate is a thing which was painted with an oil paint on the rust preventive paint, but it was hard to peel off considerably, and the teeth did not stand with the brass cup brush. When I tried using this product, the wilting fell, the rust inhibition and the painting were splendidly peeled off. Although it is the limit of two sheets with the above steel plate, it is thought that the effect is higher than the cup brush or sanding disc tried until then. For stubborn paint peeling, this product and "painting cleanup" were used together. First of all, we peeled off with this product, and we treated the remaining parts of the main points in the "Clean paint". It also exerts its effect on rust removal. This product is perfect if it does not process in large amounts, but in my case I had to do as many as 16, so I was dissatisfied with the price a bit. I was thankful for having 10 copies made around 4000 yen. Sounds good! I should have used it earlier. It is much better than wire type cup brush! It is safe and secure. The surface after finishing is outstanding. . .
Rust removal of wire type is done because the wire scatters. It just decreases quickly. You can clean paint that you peeled off with rust. The price is cheaper than other companies, but it will be saved if it goes down a little more. Although it is cheap and good, I thought that it was too early to reduce. Although I can get it well, the last one is powerfully downed, I want you to work hard just to get used up.